Pickled Papaya (Jeruk Betik) made with red chillies, salt, vinegar and sugar. 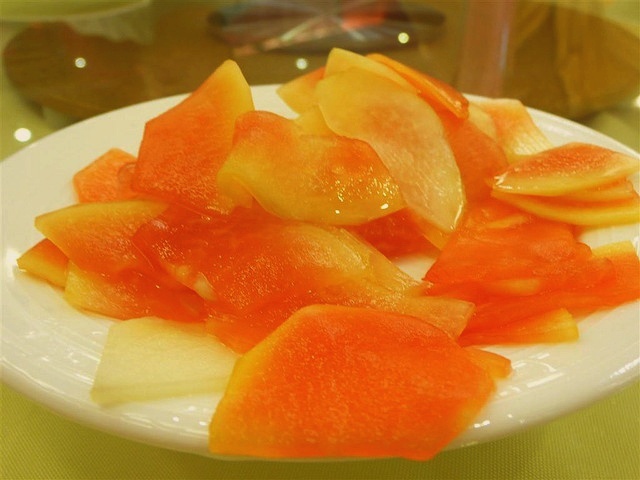 Simple appetizer which taste both sweet and sour, a delightful combination. Season papaya and chillies with salt for about half an hour. Rinse papaya and chillies. Wipe dry. Sun for half an hour. Mix vinegar and sugar until sugar dissolves. Taste. Stand for about half a day before serving. Hey this is so easy! Gonna try this using mango instead.